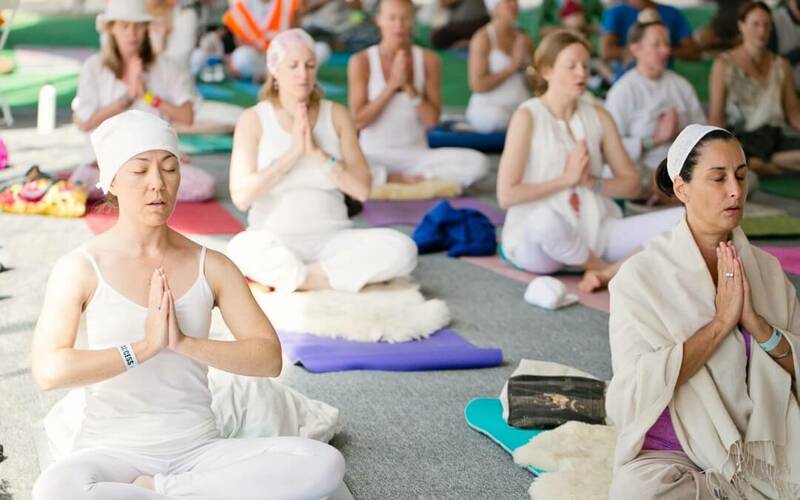 At the start of each Kundalini Yoga class, we ‘tune – in’ by chanting the Adi Mantra. The first time I “tuned in” was with almost 1,000 people at Sat Nam Fest in Joshua Tree, California. I arrived to Sat Nam Fest alone. I had no idea what Kundalini Yoga was and I didn’t know anyone at the festival. I signed up to volunteer & drove from San Francisco on a gut feeling. I didn’t think about what I was doing, I just knew – I had to go. As I rub my hands together, my palms light up from the static and create a small fire between my fingers. By bringing my hands to my chest, I feel as though I am turning a key into a lock. The connection between my thumbs and my sternum is a tunnel for which the heat from my palms flows to my heart center. I feel a warmth build inside my chest and then see a small spark ignite and watch it grow into a brilliant sun. I feel like I am being held in a loving embrace, as though I were a small child in her mother’s arms. Sitting with my hands at my heart in prayer position I feel my body relax. My shoulders drop down from my ears, the gripping in my stomach releases, and my hips fall open wide. “I am safe,” I think to myself. I inhale deeply and pause. At the top of the breath there is a moment of complete stillness. With an exhale, a primal sound, “Ong,” is birthed from my low belly. For the first time in my life, I don’t care how I sound. I give myself permission to open the flood-gates of my heart. As I sing, I feel myself transform from the little girl who was told she could not sing, into a woman who is reclaiming her Truth. I see tall castle-like walls made of shame crumble around me. When the dust settles, I see myself standing alone in a field. The chains that were once wrapped around my diaphragm constricting my voice, break free, opening me up breath deeply. The tone of the mantra dissolves the boundaries of my body. I see colors of pinks and yellows radiate out from my heart center. The light expands, encompassing my neighbors, the tent, and the world. As I sing, I feel the heaviness of shame lift from my body. I am weightless, swept up in this current of energy, as though I were floating down a river. As we chant the Aad Guray Nameh mantra, my attention goes directly to my navel center. The sound rises up from just below my belly button and flows into my heart, then pours out my mouth. With each word, I am empowered with a deep sense of reverence and dedication to sing. Even though I do not know the meaning of these words I sing out because something mysterious is compelling me to. I hear a voice singing. Its tone is loud like a lion’s roar and sweet like a grandmother singing bedtime lullabies. And as I listen to this song, I hear a woman calling for love. She is yearning for unconditional love like the love of a mother, and insatiable love like the love of a beloved darling. She is asking for someone to heal her and to make her feel whole. There is a longing in her song that makes me feel sad because I know that no matter how many tears she cries or how long she sings for, that she will never get what she really wants. With this answer, I recognize that her song is my song, and that this woman is me. With a deep inhale, I drink in the sweet elixir created by our group’s chanting and direct it to my heart. By “tuning-in” hundreds of yogis become one and a white tent in the desert becomes a magical, sacred space for healing and transformation. By tuning in, I am remembering how to love myself. Even though I had never heard the Adi Mantra or the Aad Guray Nameh Mantra before Sat Nam Fest, I felt an immediate and deep, heartfelt connection to the mantras. By chanting these sacred words, I set myself free from past patterns of shame and hate. As I sing out, I remember who I really am. Buy tuning – in I am remember how to love unconditionally & limitlessly.